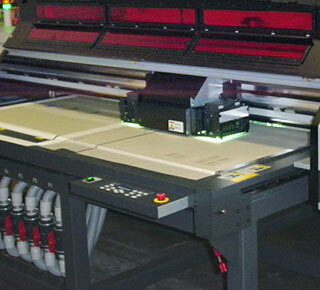 Our Large format digital printer has UV lamps installed on both sides of the carriage, to cure (dry) the ink right at the print head and allow higher production speeds with bidirectional printing. Capable of printing 6-colors plus white or clear and using UV curable ink that is free of VOC (Volatile Organic Compounds). It is less odorous and thus ensures a cleaner working environment.